In a bid to familiarise themselves and to showcase their work and contributions to the development of the country, the Commercial Agricultural Producers and Processors Association (CAPPA), which comprises different agribusiness investors, last Friday 8th February, 2019, engaged top government officials in the Ministries of Technical and Higher Education (MTHE), Agriculture, and that of Environment Protection Agency (EPA) in Freetown. The CAPPA investors include SOCFIN Agricultural Company (SAC), Sun Bird Bio Energy, MIRO Forestry, Ned Oil, Natural Habitat, DOLE, Sierra Agra, and Sierra Tropical Limited. 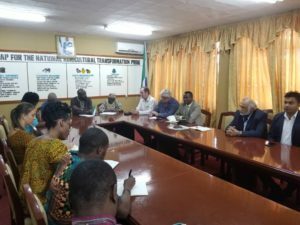 Speaking during their visit, Executive representative and Ambassador of CAPPA, Ammar Kamara, said they were at the MHTE to pay a courtesy call to the minister, as a collective association, in order to improve their partnership with the government and learn from them some of the gaps and opportunities in which they can contribute as a body. 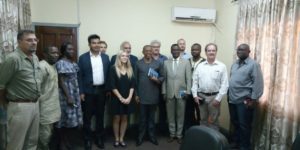 He lamented that their main goal was for the government and the people of Sierra Leone to know what they were doing and their contributions to the development of the country. CAPPA Chairman, Phillip Tonks, who doubles as the General Manager for SOCFIN Agricultural Company, said they have been helping in the construction of schools in their area of operations and employing lots of people. He added that even though they were not dealing directly with higher education, but they have contributed immensely to the educational sector of the country. He noted that as the world was growing with the country developing, there was need for skilled personnel to enhance their operations. “We are a large employer and we predominantly have plantation and skilled workers. There are 950 skilled workers that are employed- from finance, forestry to factory,’’said Tonks, adding that they have started taking interns from different institutions across the country to augment the work of core staff members. On his part,CEO of SUN Bird, Rajiv Bali, stressed the need for skills development, which he said was very critical to their work, adding that their company makes use of elephant grass and process sugar to make ethanol. He also urged the need for high-tech and knowledgeable people as the world move to more mechanization, which to him was a way of developing the country, especially the agriculture sector. Permanent Secretary at MHTE, Gilbert Cooper, said the Ministry is new and that the new government unbundled and separate it, adding that their responsibility is to improve technical and vocational institutions all across the country. He underscored the challenges facing vocational and technical institutions in the country, thus calling on the investors to map out their needs on different skills they thought would be necessary. He disclosed that they were working on the policy for the operationalisation of vocational and technical education in the country. He emphasised that there was need for collaboration and thanked the investors, stating that such was the type of engagement they would want to have with investors. He stated that as a government, their business was to create the enabling environment for investment in the country. Deputy of Minister of MHTE, Dr. Turad Senessie, welcomed the initiative and urged the investors to continue with such engagement. Minister Turad said they were working on a holistic policy that would determine the pathway to the realisation of vocational and technical education, coupled with the specific skills in the country. Meeting with the Ministry of Agriculture officials, the SOFCFIN boss, Tonks said that it will take time for each of the companies to start thinking of realising profits due to certain challenges. ‘’If current investors are happy, they will be the spokespersons for the government and the country,’’ he noted. He called on government to look into their challenges which includes the current land dispute with community people, non-applicability of regulations at the seaport, and the non- applicability of tax exemption laws that were seriously hindering their operations. Patrick Blake, Vice President of Sierra Tropical Limited, a company that produces pineapple, highlighted their challenges, which, he said include the three -weeks or more delay in the clearing of their seedlings and other equipment at the seaport and the exporting of products. “I will be shipping my products to Walmart and if there is any delay on my part, my company’s credibility will be at stake,’’ he stressed. The CAPPA members called on the government to also look into the issue of power supply in their area of operation, stating that running an industry with generators could be very much expensive. They also urged government to consider tax exemption for the importation of agricultural equipment and machinery. Deputy Minister of Agriculture,Sam King Brima, heaped praises on the investors for investing over Eight Hundred Million United States Dollars in the agricultural sector and their effort in creating jobs for citizens across the country, which he said have helped reduced burden on the government. He noted that all the concerns raised were solvable as President Bio has admonished them to work in collaboration with other line ministries. “We should have a uniform treatment for every investor across the agriculture sector. One should not benefit from a duty waiver for tools, while others are being asked to pay. Our government is committed to every word we say and our aim is to allay the fears of investors in this country as the private sector has lots of impact on our economy,’’ he said. Minister Brima assured that government was working on a plan that will put an end to disturbances in relation to the acquisition of land, adding that the fees for land lease will be increased to lay the long cry of underpayment by land owners to the rest. At EPA, CAPPA members registered their concerns to the Executive Chairman, Foday Moriba Jaward, over the high cost of Environmental Impact Assessment (EIA) license fees, which they said didn’t favour them at all. According to them, they should not be placed in the same category with the mining companies, which have greater environmental impact than agriculture. They cited countries like Nigeria where they charge $ 12,000 per annum, while in Sierra Leone its $71,000-five times higher when compared to other countries. In his response, Professor Jaward promised to look into their concerns, but noted that being an institution incorporated by an Act of Parliament; they were working on protocols through the Attorney General’s Office to table the Act in parliament for amendments. He however stated that most of the companies who met the EPA safety standards have realised some reduction. The EPA boss however commended SOCFIN and Gold Tree for their safety and environmental maintenance, which he called on other companies to emulate, adding that when he took over the mantle of leadership, there was low level of compliance since some companies cannot afford to pay in bulk their EIA fees. He said upon taking up leadership, he instituted a mechanism that now saw payment being divided in three folds- fifty percent, thirty percent and twenty percent. “The New Direction is here to encourage investors and whatever concerns you raise, we will do everything humanly possible to address them. We know you can’t operate without having any impact on the environment but what is necessary is to mitigate it. Our children should not grow to ask us questions we cannot afford to answer concerning the environment,’’ he said.